“The statistical data show the urgent need to create opportunities for actual employment of Roma, while the economies’ progress reports point out the need to change the approach in this area”, said Orhan Usein, RCC’s RI2020 Action Team Leader, opening the conference. According to the 2017 Regional Roma Survey of the United Nation’s Development Programme (UNDP), the share of Roma youth (ages 18-24) left out of the employment, education and training ranges from 73% to 86% in the Western Balkans. In addition, the analysis of the 2017 progress reports on Roma integration submitted by the governments of the Western Balkans, showed that 54% of the employment measures planned within national action plans for Roma integration are fully or partially implemented, indicating room for improvement in the future. The comparison of the data from 2017 to the 2011 show that the employment of Roma across the region is gradually worsening. The lack of employment opportunities results in less Roma participating actively in the labour market force in the region. Such situation is pushing more Roma into poverty and dependence on social services. “The annual monitoring of the South East 2020 Strategy has shown the first signs of economic recovery in the Western Balkans Six which has been translated into continuous increase in employment rates since 2016. Over 600.000 new jobs were created in the region, however these were not equally distributed across the population of the Western Balkans. Highly educated and man benefited the most in terms of employment. In this context we want to assist the governments to better design active labour policies and measures for the benefit of all citizens, including Roma,” said Senior RCC Expert on Skills and Mobility, Vanja Ivosevic. Findings of the ESAP project revealed that active labour market measures are very limited in the region, especially their effects on the most vulnerable groups of population, including Roma. Mainstream active labour market measures are largely excluding Roma in their design, and although there are some innovative measures with the potential to more significantly contribute to the employment of Roma, little has been implemented. 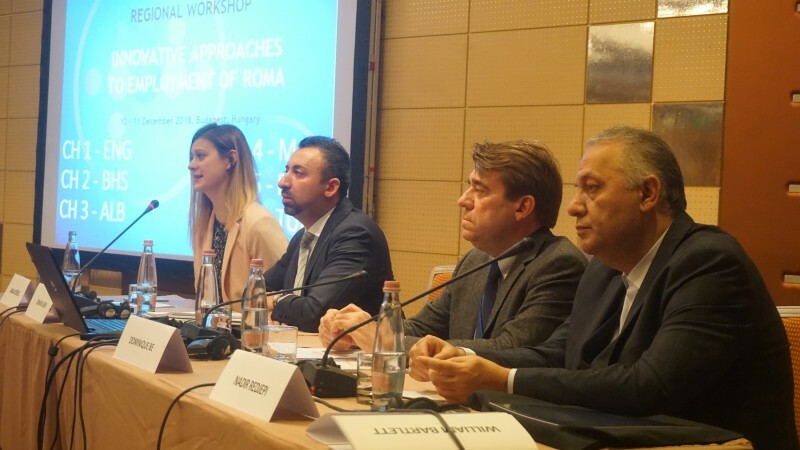 Nadir Redjepi, Director of the Roma Education Fund (REF) underlined the importance of exchanging experience and discussions on how the employment of Roma can be advanced in order to shape up policy agenda on one side and improve practice on the other side. He also reminded that since 2005 REF has invested in development of competences and human capital of young Roma in order to close the gap between Roma and non-Roma. Dominique Be, Roma Integration Coordinator at the European Commission’s Directorate-General for Employment, Social Affairs and Inclusion reminded that the National Roma Integration Strategies are in place in all pre-accession economies, underlining that ensuring equal access to education, employment, health and housing is part of the enlargement process. “However, much remains to be done. No improvement has been observed in access to employment, and the share of young Roma not in employment, education or training (NEET) has even increased. Thus, there is a need to increase ambition on progress during the pre-accession phase”. In addition to overviewing current situation of employment of Roma and active employment measures implemented by the region’s government, special attention at the conference will be given to exploring the undeclared work – its characteristics, types and sectors it is most prevalent within, as well as proposing policy measures that could best address it. Conclusions from the conference aim at contributing to the reduction of the gap between the employment rate of Roma and the general employment rate in the enlargement region. This regional event brought together around 50 government officials, including National Roma Contact Points, representatives from the public employment agencies and the ministries from the EU enlargement region dealing with the area of employment/social welfare, education and local self-government, representatives of civil society organizations, and international organizations including UNDP. Agenda - Regional Workshop "Innovative Approaches to Employment of Roma"
Concept Note - Regional Workshop "Innovative Approaches to Employment of Roma"